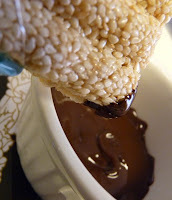 Today was Day #2 of Chocolate and Sesame Theme Week. 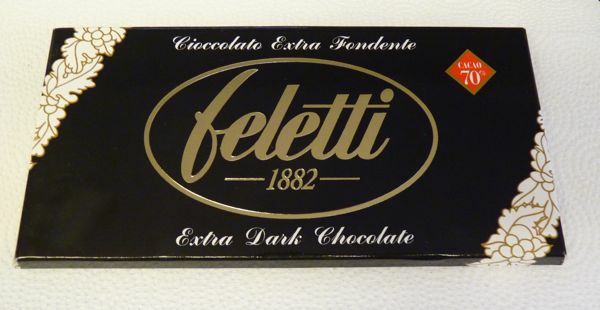 After a small nibble, I made some Cioccolato Extra Fondente (70% cacao) fondue out of this Feletti dark bar from Italy. 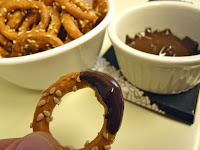 I then dipped gluten-free sesame pretzel rings and also a very tasty sesame seed candy "bar" from Greece into this melted chocolate. Later in the week, I will go out hunting/shopping at a local international market to find some chocolate and vanilla halva(h), a popular blend of chocolate and sesame seed paste from the Middle East/Mediterranean region.